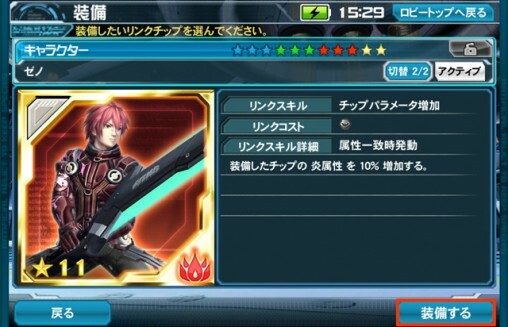 Now you can link your character or weaponoid chip to other chips for bonuses and extra effects. 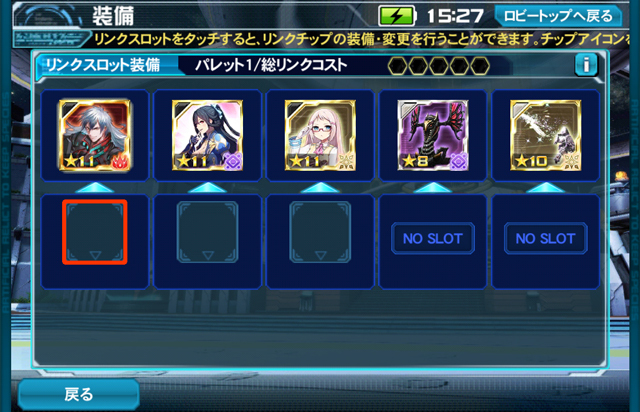 Within this slot you can equip a specific chip that activates under certain conditions. Chips that you attach beneath the main chip will be known from here-out as the [Link Chip]. Provides a bonus that increases a portion of the stats that are taken from the Linked Chip. Stats could be HP / CP / Element, etc. A special skill from the [Linked Chip] that performs certain effects. Link Skills activate when the element for the [Linked Chip] and [Main Chip] match. Tap the [リンクスロット装備] button (highlighted in red) to access the Link Slot Equipping screen. 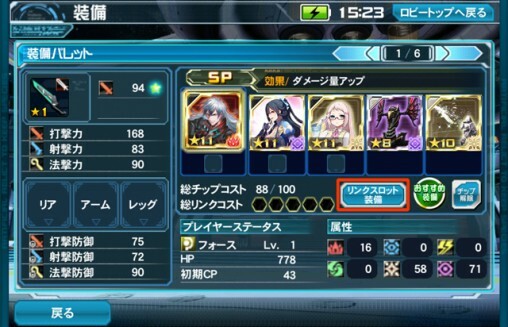 Weaponoid, Character, Photon Arts, and Technic chips have spaces for [Link Slots]. 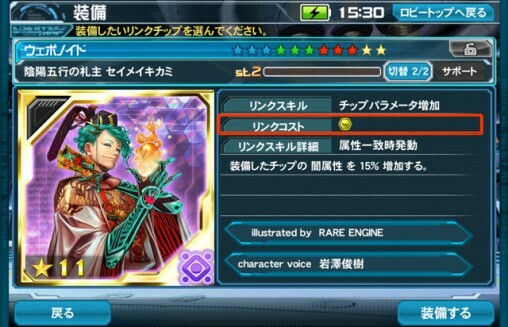 Touch the empty space (highlighted in red) to add a chip into the Link Slot. 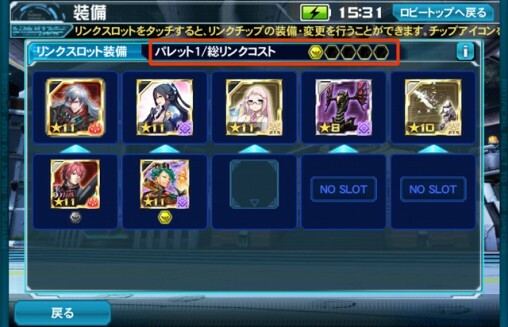 In the [Linked Chip Selection Screen], certain chips will have flashing blue text stating its リンクスキル (Link Skill) is compatible. Recall that Link Skills only activate if the [Linked Chip] element matches the [Main Chip]. This is not the same as a [Link Bonus] which can apply even if the elements do not match. Press the tiny blue button [切替2/2] to switch pages. This will show the Link Bonus of the selected chip. Press the tiny blue button [切替1/2] to switch pages. 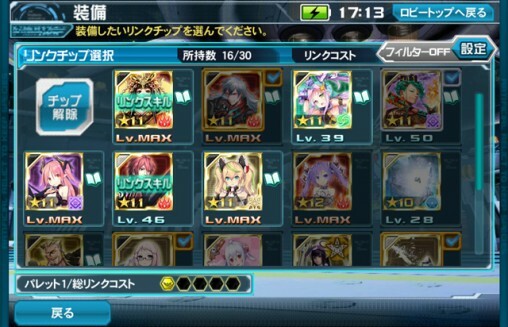 This will show the Link Skill page. 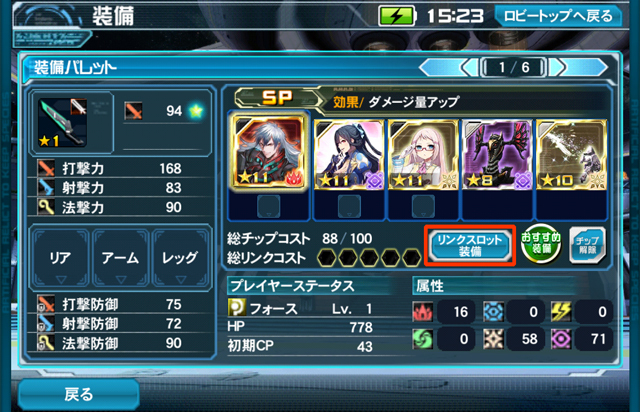 Each Link Skill activates when the [Linked Chip] matches the element of the [Equipped Chip]. Zeno’s Linked Skill increases the equipped chip’s Fire stats by 10%. Aside from increasing chip stats, some will decrease CP consumption, or increase the activation rate. Once you are finished, press the [装備する] button to equip the chip to the Link Slot. 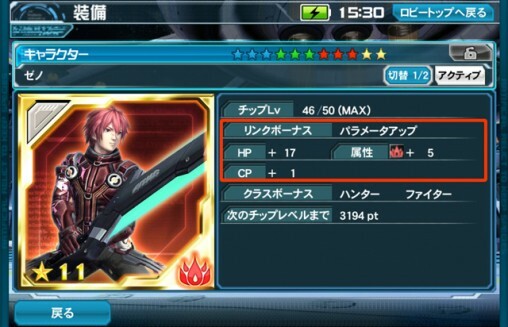 Each Linked Chip has a リンクコスト (Link Cost) which limits the amount of chips you can equip. If the Link Cost icon is gold, then it fills up 1 Link Cost slot. If the Link Cost icon is grey, then it fills up no link cost slots. You can only equip up to 5 gold link cost slots.